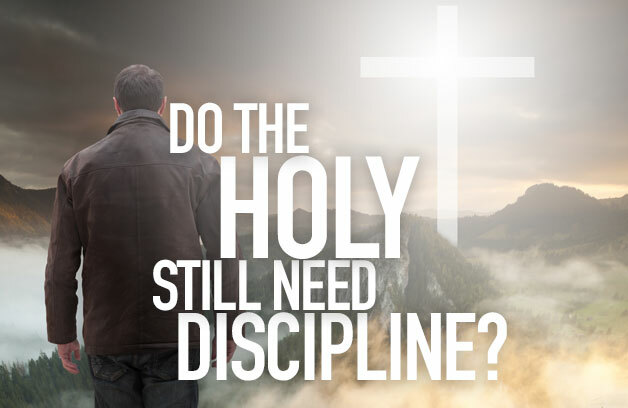 If holiness has been reached why the continued discipline? Cannot it now be laid aside as the scaffolding is removed after the building is finished? Is it not inconsistent to profess purity of heart and then admit the continued need for discipline? Not at all, as we shall see presently. But first, let us concede that much unwholesome discipline will drop off when one finds perfect rest. Extreme and unnatural self-discipline is often but the scourge of a restless, hungry heart, trying to conquer sin. Persons so afflicted often live a life of strain: they are overscrupulous and petty; prudish to the point of morbidity; easily shocked and quick to criticize others; afraid to laugh lest they be guilty of levity. This may be an unconscious attempt to compensate for some hidden sin, or hold at bay some beast of lust or hatred; or possibly it is an attempt to starve sin to death by making sure it gets nothing to feed upon. This is heroic and not to be despised, though it is to be pitied, for there is a better way. When by confession, brokenness, and cleansing such a person comes into full and happy adjustment he can relax, breath freely, act naturally, and be a normal human being. The straight jacket is not needed when moral sanity has been reached. But if there is grave danger that self-restraint may so “go to seed” as to lead to a character stalemate, there is also grave danger that a newly emancipated soul, rejoicing in his wonderful freedom, may suppose that discipline can now be dispensed with altogether. If there is no sin in the self, why the need for self-restraint? Therefore we must exercise some measure of discipline in order to see to it that our souls are at least as well cared for as our bodies. Regular devotional habits will pay large dividends. Haphazardness will starve spiritual life into anemia, and a starved soul is a poor spiritual risk in any circumstances. 2. Secondly, continued discipline needed to keep the body in its place. Though it is “by the Spirit” that we put to death the deeds of the body, yet we are still the ones that do it. The power is given by the Spirit but the action is ours. Discipline is not the scaffolding: discipline is the building. It is the daily life in which the physical is kept subservient to the spiritual. Entire sanctification is not a fairy existence in which we are now exempt from such requirements; it is the equipage by which we now can meet such requirements. After all, what is holy living anyway? It is devoted living; but it is also glorifying God win our bodies, which is another way of saying, using the body in harmony with God’s will. As long as the body is clamorous in its very nature, just that long must one’s authority by constantly asserted over it. “Killing the deeds of the body, “ “keeping under” the body, and maintaining the consecration of the body as a “living sacrifice” are lifelong requirements. Such maintenance is disciplined living, in its primary sense. 3. In the third place, discipline is a proper facet of the holy life because without it the believer will not reach maximum efficiency in the Lord’s service. Of itself the baptism of the Holy Spirit gives neither a trained mind no trained hands. The holiest soul may be ignorant, awkward, and blundering. He may be haphazard and at loose ends. He may have no trade, skill, art, or profession. But not for long. If he is truly holy, in the Christian sense, he will not be content with begging. No, his inner renovation in pardon and purity will at once bring meaning and purpose into life, and inspire a strong desire to fulfill that meaning and achieve that purpose. Therefore he will immediately begin tying together the loose ends of his personality and bringing all his ransomed powers under tribute. If there is a buried talent somewhere, it will be dug out and unwrapped. If a person is totally without ambition, holiness will give him some. But that ambition will never be realized, even when it is within the range of one’s natural endowment, unless its possessor disciplines himself through the training, sacrifice, restrictions, inconvenience, and concentrated application which its realization may demand. We may be ever so fit for Heaven, but we are not there yet; and it is a pity to thwart our usefulness by being misfits on earth. God can use individuals, to be sure, but only when and if that individuality is tempered by some measure of practical adaptability.